In 2017, PSSA membership voted at Uniform Night for their top two charities to give back to. 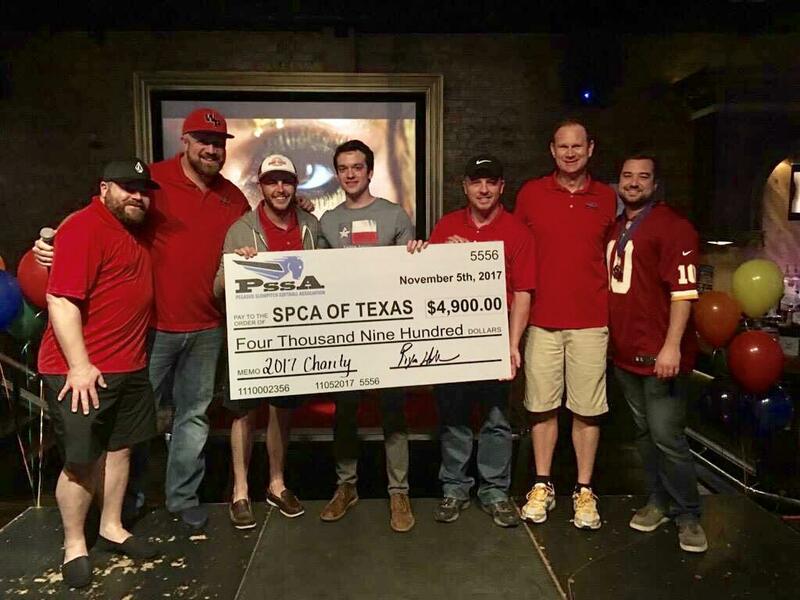 This year, PSSA membership chose to raise money for SPCA of Texas and Resource Center. The membership fundraised at Uniform Night, Switch Hitters, and Miss PSSA and raised a total of $9,800! 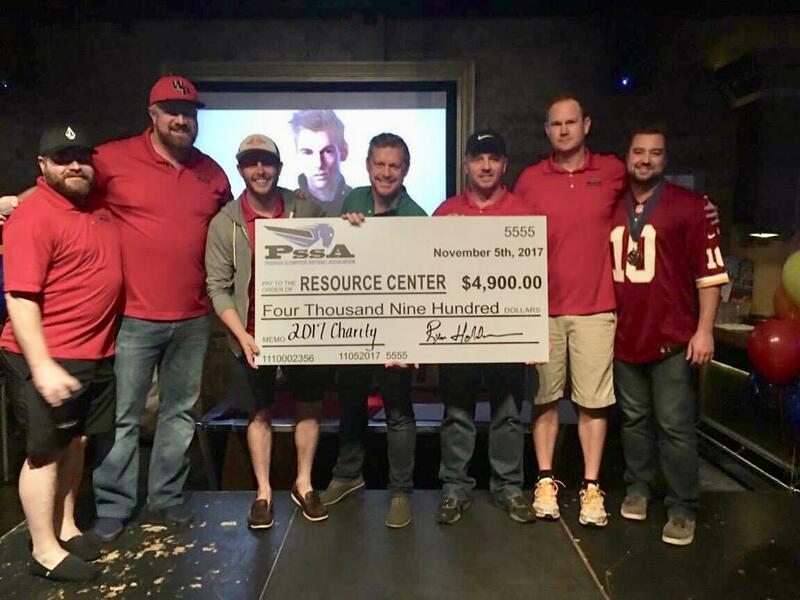 At our Fall Ball Awards party, we presented a check to each of the beneficiaries. PSSA is proud to play and proud to give back to our community. PEGASUS SLOWPITCH SOFTBALL ASSOCIATION "COMMUNITY GIVING BACK PROGRAM"
We are a nonprofit organization whose goals are not limited to promoting amateur softball throughout North Texas, but also include striving to give back to individuals and organizations in our local community. 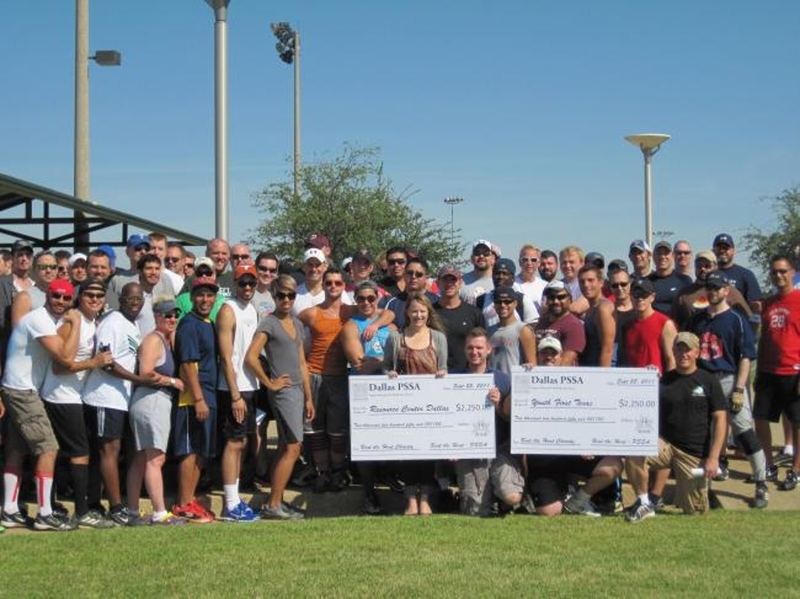 Starting in 2011, PSSA began donating the proceeds from its annual softball tournament "Beat the Heat Classic" to fund local charitable organizations. League members are encouraged to nominate their favorite nonprofit organizations in order to receive financial grants. These grants will be awarded at the PSSA End of Season Banquet. Organizations must be located in the defined territory of PSSA. Their various services and assistance programs must be involved in the north Texas GLBT community. Any current member in good standing of PSSA, including Honorary Members, may submit nominations. The Giving Committee Chair will screen all submitted nominations to confirm eligibility. The top 5 groups receiving the most nominations will be placed on the ballot during the spring election that will be held during the End of Season tournament. League members will then vote for the organization they want to receive funds. Funds will be granted to the top 2 groups. They will receive checks during a short ceremony at the conclusion of the banquet. League members may not nominate organizations for which they are employed. Members can nominate those for which they themselves have received assistance. Testimonials are often the best way to describe both the effect and impact that funding this group might have. League members may submit the name of one charitable organization to receive grant money. Nomination left incomplete or for groups not eligible to receive funding will be disqualified.